IN-DEMAND Brisbane centre James Roberts did his chances of a rich new NRL deal no harm with a double in the Broncos’ big win over Canterbury. The Broncos smashed the Bulldogs 42-12 on Thursday night, with Roberts’ two tries part of a second-half onslaught that all but ended their opponent’s finals hopes. The 24-year-old is off contract at the end of the year and has reportedly been approached by at least five other NRL clubs as he seeks a significant rise from his current $300,000 per season deal. 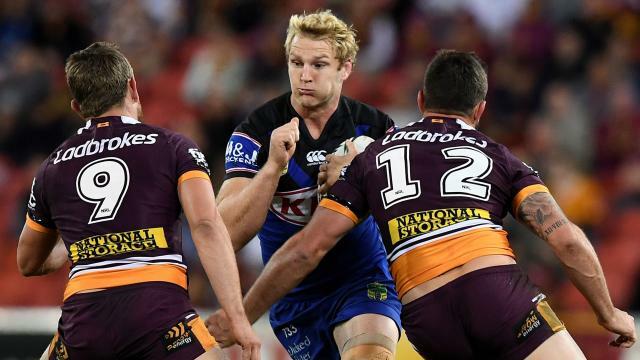 Roberts’ manager Jeremy Donovan has said he won’t accept less than he is worth just to stay at Red Hill, where seven of his teammates have recommitted to the Broncos in the last four months as coach Wayne Bennett lays the foundation for a premiership charge. Kodi Nikorima, who signed a three-year extension this week, said he has been pestering Roberts to follow their lead. “I’ve been in his ear for the last couple of weeks now, telling him to re-sign,” he said. “I feel like we’ve got something we can do, something great we can build on. I hope he re-signs. Ben Ikin, Nathan Ryan and Ben Glover are joined by Raiders recruitment manager Peter Mulholland to discuss an innovative new philosophy behind roster building.